August 20, 2014 – Amanda Rettke here, from the blog I Am Baker. Today, we’re talking (bright and delicious!) entrée salads. 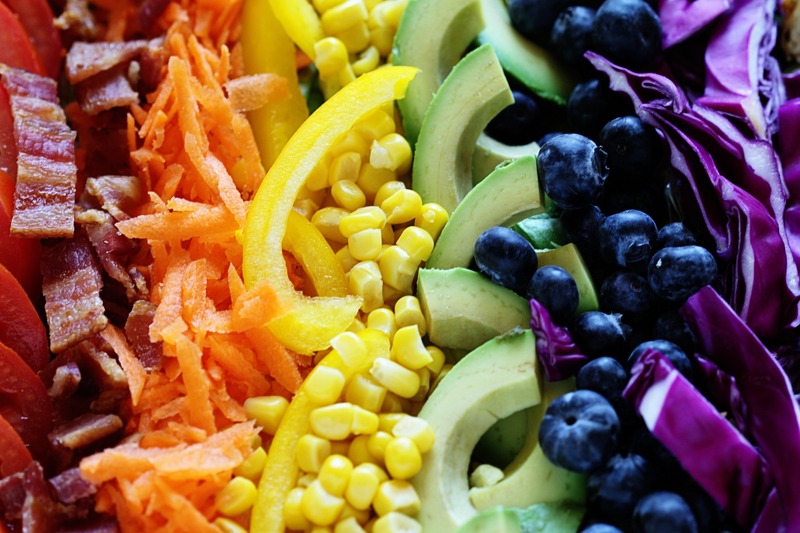 One of my favorite meals in the world is a Cobb salad. It has a little of everything: meat (usually chicken), greens and vegetables. This particular version of a Cobb salad has all of that as well as some fruit and bacon! Bacon. Oh, how I adore thee. 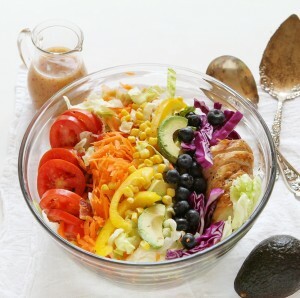 I laid it out here with all of the ingredients lined up and covering a bed of lettuce, but you could just as easily put all ingredients in a large bowl. But I can’t help but love the way it looks when laid out in rainbow-color order. There is just something so beautiful and fresh about it all! And there is bacon. Did I mention I adore bacon? The recipe is for a quick assembly, but do feel free to customize in a way that is most pleasing to you! 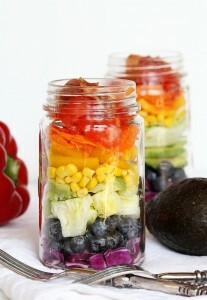 Of course, if you want to really have fun with your food, put it all in a jar! Not only is this beautiful, but convenient. Layer the ingredients in a jar, then head out for a picnic with your family. Recipe and Photos Courtesy of Amanda Rettke, I Am Baker. Cannot find the recipe for mango salsa !? Hi Anthony, the Chili Lime Fish Tacos with Mango Salsa recipe can found here: https://www.aldi.us/en/recipes/main/seafood/chili-lime-fish-tacos-with-mango-salsa/.